I have read some reporting and commentary on the Casey Anthony trial, especially in the last few days. Something went wrong there, and I too believe that the little girl died by neglect, maltreatment, or malicious intent. The mother is surely guilty of some serious, serious wrong. Although the stories constructed by the prosecution and the defense seem flimsy, still my sense of how humans behave tells me that the mother harmed her daughter enough that she died, and then with her family’s help she obliterated the physical evidence. And yet I am not appalled or surprised by the jury’s verdict of “not guilty.” The prosecution’s case was built on circumstantial evidence. The job of a jury is to judge the facts of the case as they have been presented. Were there enough facts? In 1998, I served as a juror on a criminal trial in Massachusetts. A teenage girl had accused her stepfather of sexually assaulting her, and the Commonwealth of Massachusetts prosecuted him for the charges. Along with my fellow jurors, we found the girl, whose first name was also Jane, to be a totally credible witness, and we believed that she had been harmed by Dennis, her stepfather, and also by her mother, Wendy, who took the stand in support of her husband and undermined her daughter’s testimony. The case built by the Commonwealth, however, became an exercise in He Said/She Said. The Quincy Police had gathered no physical evidence, no material witness. In 2003, five years after the trial, I wrote a short account of my experience for a graduate school class on pedagogy at Simmons College. Each of us had to write in response to a prompt that one of our classmates had designed as something s/he would assign to high school or college students in a writing class. The prompt I addressed asked me to reflect on Robert Frost’s poem, “The Road Not Taken,” and describe an experience in my life in which I had had to make a difficult choice. I didn’t pretend to be a high school writer; I wrote the essay [read it here] from my age and experience. Inside, I felt like I was breaking apart. I could not imagine voting “not guilty,” although some of my fellow jurors attempted, vigorously, to persuade me to see the trial through their eyes. I did not try to persuade my fellow jurors to change their vote to “guilty,” nor did I even want to. I tried to explain my position, over and over again, differently each time, to justify my unshakeable belief in Jane Phillips. I wanted the trial to go away, for the Judge to call us back into the courtroom and say “time’s up” and then, discovering the absence of unanimity, to release us. […] At the end of every day, during the 15-minute drive back to my house, I cried. Not just for this other Jane. I cried for myself. Cried for some end I would never get to… Cried, wanting to not choose, wanting to be absolved of the responsibility to decide. The Court does not exist for any individual’s personal or moral sense of rightness, or for our satisfaction. It upholds a due process. I am no expert, no Nina Totenberg, but I have no doubt that jurors on the Casey Anthony trial approached their awful responsibility with great seriousness, and some degree of heartache. 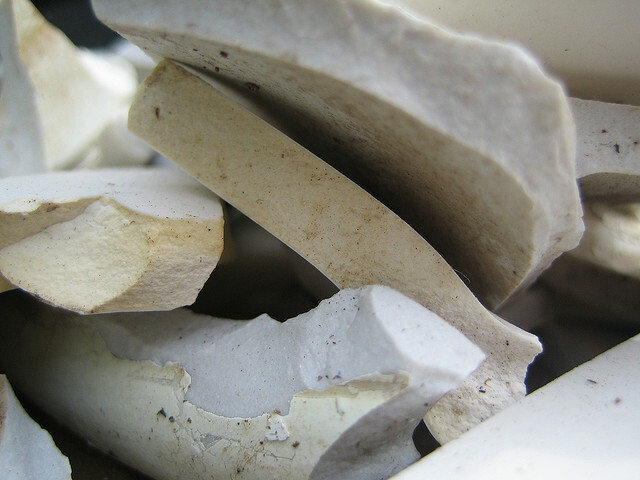 First image, “Broken Pottery,” by mickeq on Flickr via a Creative Commons license. 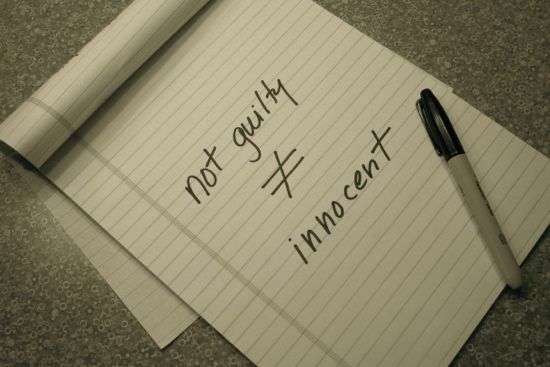 Second image, “Not Guilty Does Not Equal Innocent,” is mine. I almost served on a grand jury a few years ago. A young African-American man was accused of trafficking cocaine through his air cargo job at JFK airport. During jury selection, the judge explained that we would hear and see certain kinds of evidence–some of which was collected under Bush’s “Patriot Act,” which I found to be disgusting and unjust. The accused was clearly guilty–there was phone taps and video, emails and seized narcotics–and the case was mostly about the due process. But I was thinking about whether the people in the room could actually make up a jury of this young man’s peers. I was thinking about the circumstances of his life, and what drove him to do such things. I was looking at the team of white lawyers and the defendants single state-appointed African-American lawyer. It was all too much for me, and I argued, in private, with the judge about how I could not–would not–serve on this jury and be impartial. This post made me think a lot about my own experience, the extraordinary possibilities for justice and injustice, and the ambiguous area of neither, that our legal system provides. I, too, cried myself home, after being dismissed. I made a few statements in front of the whole courtroom that the lawyers found to be–whatever they found it to be–unwelcome. “Why are you crying?” my boyfriend asked. “Everything,” I told him. My mother served on a jury for a murder trial. A mother killed her two children, which was indisputable, so the defense focused on getting her life instead of death. Knowing what Mom went through, I feel pretty certain that the jurors in the Anthony trial did their job and took it far more seriously than the ghouls who’ve followed the case as if it were part of the CSI franchise but probably wouldn’t have given it a second thought had the victim not been a white child. Jane, I just read your longer essay–wow. I’d like to say something more articulate and insightful than that, but I’m simply blown away by the intensity of your experience and the incredible integrity with which you executed your duty. Though it’s clearly a wound that will never fully heal, I hope that at least you feel at peace with the way you handled yourself, and with your deep honesty. How hard that must have been for you, though, especially as a relatively new mother yourself. Thank you for this, Jane. I didn’t follow the case, but I, too, am weary of people blaming the jurors. No one but those who were behind the closed doors of the deliberation room knows what truly happened. If jury cases were decided like “Dancing with the Stars,” where would we be? I have also been fascinated by the Casey Anthony trial, and really appreciate your thoughts on it and connections back to your own experience as a juror. I have personally never doubted that the jury did its job, and have been deeply troubled by the reaction of those viewers so aptly described by James. Your story and the others shared here make me think, too, about what an enormous responsibility being a juror is, and how complicated.